Norman Hartnell (born June 12, 1901 died June 8, 1979) was a British fashion designer and is best known as the dressmaker to Queen Elizabeth, the Queen Mother and later, her daughter, Queen Elizabeth II. In this post, I will briefly discuss the fashion career of Hartnell and his work with the Royal family, including the famous White Wardrobe that he designed for Queen Elizabeth. In the mid-1930s, Hartnell had firmly established himself as a successful designer specializing in elegant afternoon and evening dresses for the London society. He also designed wedding and bridesmaid dresses for several British Royal Weddings. The Duchess of York (later known as Queen Elizabeth, the Queen Mother) met Hartnell for the first time in 1935 when her young daughters, Princess Elizabeth and Princess, were bridesmaids in the wedding of Prince Henry (the Duke of Gloucester, the third son of King George V) to Lady Alice. 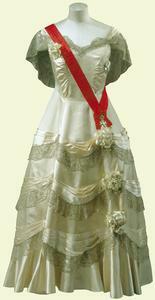 Unfortunately, due to the death of Lady Alice’s father the large state wedding scheduled for Westminster Abbey was cancelled and the royal couple was married in a smaller private ceremony at the Chapel Royal in St. James Palace so the public only saw Princess Alice’s going-away outfit that Hartnell had designed. In 1937, when her husband, Albert, unexpectedly became King George VI, Queen Elizabeth (formerly known as the Duchess of York) felt obligated to use her current dress designer, Madame Handley-Seymour, to create her coronation gown. 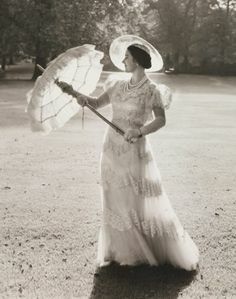 Several years earlier, in 1923, on the recommendation of her future mother-in-law Queen Mary, the Duchess of York had commissioned Handley-Seymour to design her wedding dress and had since used her to create her royal wardrobe. But, Queen Elizabeth had been so impressed with the dresses Hartnell had created previously for her daughters that she commissioned him to design the gowns for her Maids of Honor at the coronation. Once again, Queen Elizabeth was so pleased with the maids coronation dresses that afterwards Hartnell began to exclusively create her entire royal wardrobe. 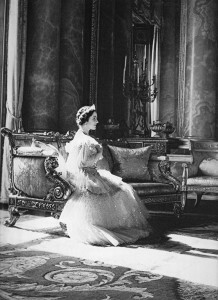 Then in 1938, prior to a scheduled Royal Tour planned to France, the Queen’s mother the Countess of Strathmore died and the trip was postponed for three weeks. Hartnell had been commissioned to design 30 outfits for the upcoming visit but since the Royal Court Mourning period required a somber wardrobe and the colorful outfits were deemed inappropriate. 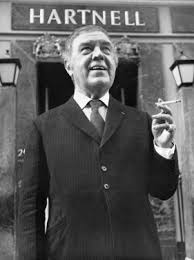 This Royal Tour was extremely important to build a solid political alliance between Britain and France especially at that time due to the growing hostilities in Europe and appearances were very important in establishing a good impression. The tradition dedicated for Court Mourning allowed black clothing and after an extended period of time eventually purple and mauve colored dresses. These colors would set the wrong tone for the visit and would also be highly unsuitable choice during the hot summer months in France. Hartnell came up with a solution to the problems when he discovered that in the past white was previously used as an acceptable color during the Court Mourning period. So, in less than three weeks new dresses were created and the Queen left London wearing somber black but arrived in Paris with an entire wardrobe of white dresses. 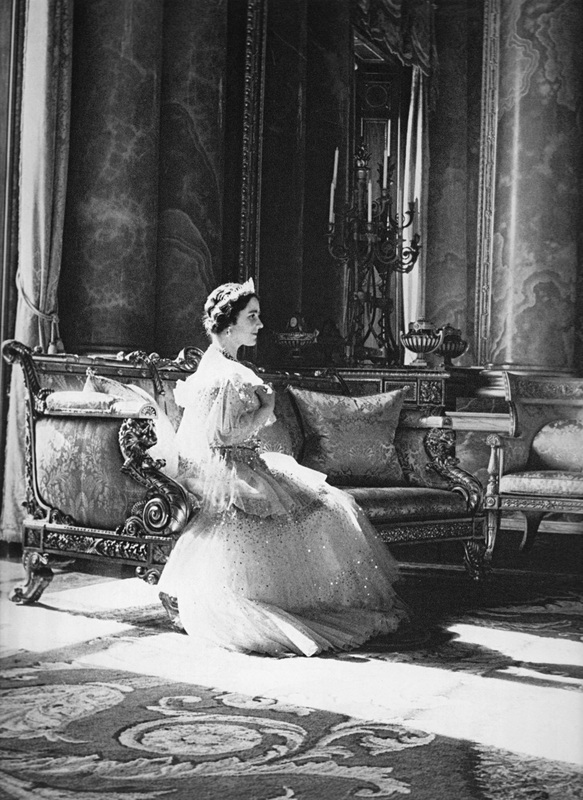 In 1940, Hartnell received the highest honor of a Royal Warrant as the principal dress designer for the Queen and he continued to make her royal wardrobe over the years for her daily Royal engagements and other events, such as the 1947 South Africa Royal Tour. Hartnell also increased his work with the Royal Family by designing dresses for the Queen’s two daughters, Princess Elizabeth and Princess Margaret, as they grew into beautiful young women. 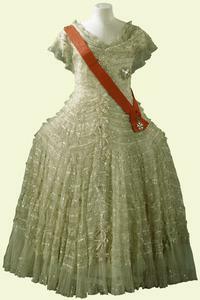 In 1947, he was commissioned to create Princess Elizabeth’s wedding dress when she married Prince Phillip and later when her father, King George VI, died Hartnell designed her coronation dress in 1953 when she became Queen Elizabeth II. (For more information and photos on these two important historical dresses, please click on the following links: British Royal Weddings – Part Three and the Coronation of Queen Elizabeth II.